There are quite a few golden rules when it comes to matching your pocket squares, which we’ll run through for you, but as with most things, experimentation is completely fine, as long as gentlemen, you’re playing by the rules! First off, let’s look at the most fundamental of pocket squares and still one of the most popular – the plain white square. Every man should have a plain white, or slightly patterned white pocket square amongst his fashion armory, as they match any combination of suit, shirt, tie or even bow tie. The white pocket square is your absolute go to guy if you’re stuck in matching hell. It's important to know that if you’ve got your eye on a loud coloured pocket square, such colours really go well with neutral coloured jackets and blazers. Combining a bright orange or red, for example, with a green or blue blazer is going to look like you’ve been caught up in an explosion at a Dulux factory, rather than cutting yourself from red carpet royalty. Bright reds, blues, oranges and pinks go really nicely with grey coloured suits and white dress shirts and will always get a massive thumbs up. 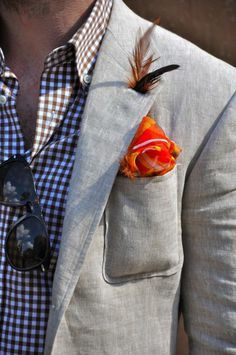 If you absolutely must combine a bright pocket square with a loud jacket, go for a red or yellow square with a blue/navy jacket, but try and add some subtlety by keeping your dress shirt warm and neutral and maybe choose a pocket square with a soft pattern or polka to break things up a little. Bold squares match muted jackets, so an orange square and black blazer just screams perfection! Tan coloured jackets really do go nicely with red or green pocket squares and will certainly set your look apart. Of course, there needs to be an element of matching, or at least complimenting between your pocket square, shirt and tie in terms of colour, but matching your square exactly to your tie and shirt isn’t really going to do you any favors in the style stakes, instead, it will all just look like you’re trying too hard! If you must match your pocket squares colour to your shirt and or tie, choose a nicely patterned or striped version that has that colour delicately flowing through it, rather than just a plain and simple block red tie and pocket square combination, to name just one of many no go’s! With your pocket square comes the opportunity to completely show off your personality. If you’re a laid back bloke go for an utterly nonchalant pocket square fold and combine it with a shirt that is unbuttoned, or if you’re proud to be a serious Simon, go for the more crisp Presidential fold and even match your pocket squares colour to your tie clip. I personally prefer the latter and the term ‘complimenting’ over ‘matching’, and if I’m wearing a grey, navy or black suit, the last thing in the world that I want is to wear a pocket square that completely matches it – it won’t even look noticeable. Another thing that I like to do is match my pocket square to my other accessories, which I’ll be talking about next week in our blog. Matching it to something as simple as your socks, watch strap or belt really does stand you out from the crowd in all the right ways and guarantees to turn heads. When it comes to matching your pocket square to your shirt in terms of pattern, the general rule is, that you can contrast patterns, as long as you have the same colour element flowing through each piece. It works due to the pure randomness of the look, but combining a red polka dot square with a yellow check shirt for example, won’t win you many brownie points with me. If you choose a striped shirt and pocket square combination, make sure that, whilst your shirt’s stripes are vertical, your pocket square’s stripes are horizontal, just to break up the combination of stripes. It's important to know your colour combinations, to know what squares best match what coloured jackets. But, if you are stuck for inspiration, browse through your latest copy of GQ or Esquire, which are littered with great pocket square combinations at this time of year. In the subtle details, you’re style will be ultimately born, so when looking for a subtle match, don’t be afraid to look beyond the block colour of your pocket square and instead match its boarders or the colour of polkas to your shirts collar and cuffs.